Whenever I'm riding and I pass a cycling shop I stop in and chat, look around, and ask if there are any "interesting" older steel bikes for sale. I must say I have a soft spot for steel bikes, especially beautifully crafted ones. My modern aluminium/carbon Pinarello is a very functional tool but it doesn't particularly inspire me. So in November I was cruising in the hills and stopped at a shop. Asking if there were any interesting bikes available the owner began wheeling a series of bikes out. The first few were nothing special, then he rolled out THE bike. It is a custom made MALAGNINI, an artisan builder from Verona province. It's made of Columbus SLX steel, has chromed lugs, fork and chainstays/seatstays. All 8 speed Dura-Ace. The bikeand components, are in as-new condition and the frame has a funky paint job that I like. It also has some nice touches such as a chainrest that is brazed onto the chainstay, and there is no seatpost collar as the seatpost uses a wedge that is driven from the side of the Dura-Ace seatpost. Nice! I took it for a long test ride (2 hours...hey, things are different here!) and the ride was so great I was grinning ear to ear. The fit was perfect. After some negotiating I purchased the bike for a ridiculously low price as steel bikes have quickly fallen out of favor as the alu/carbon bikes, and now all carbon bikes, have taken over the market. Speaking of which, it strikes me that Italian cyclists are even faster adopters than Americans of the latest cycling technologies and advancements. My Pinarello is probably 2-3 pounds lighter but this bike is the BOMB. The gearing isn't suitable for the steeper climbs but I've decided to leave it all original for now and use it on looooong, sunny, ride days. 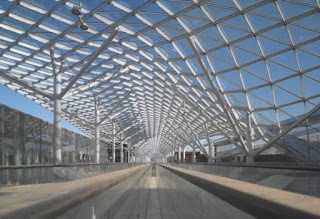 Photos of the exhibition center complex. 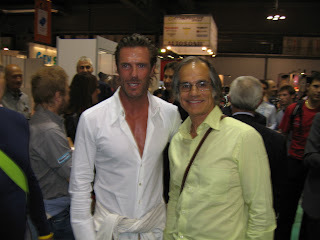 On September 15th Eros Poli, Paolo from Chesini and I headed to Milan from Verona. 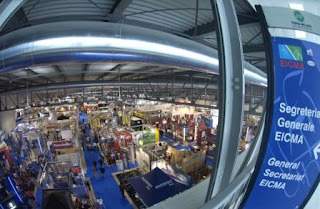 The occasion was the very big international EICMA bike show. It was a surreal experience. Here I was meeting Eddy Merckx, Felice Gimondi, me and ....WHO? ?, the Pinarello and DeRosa families, and some friendly representatives. It was over the top! More images: moon-like rock formations, a lunch stop, me, most of the group, sunset in Porticcio. 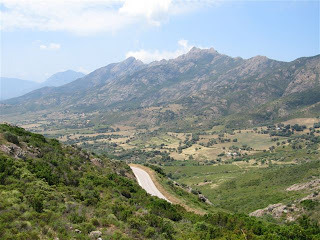 The Gruppo 1 week long club ride last year was in Corsica 4 to 10 June. 17 club members made the trip. We departed Verona on Sunday, June 4th at 0700 for Livorno. The caravan included the Gruppo 1 club van, and personal cars. The cars were left in Livorno at a long term parking lot near the ferry while the club van was driven onto the ferry. 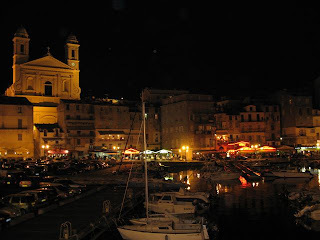 We departed Livorno at 1330 and arrived on the east coast of Corsica, at the port of Bastia, at 1730. 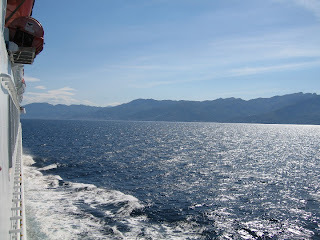 We had a fabulous sunny day crossing the Canale di Corsica which connects the Mar Ligure and Mar Tirreno. We checked into our hotel and prepared the bikes for departure the next morning before heading off to a seaside restaurant for dinner. 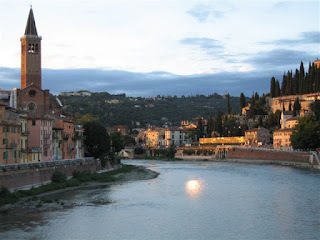 June 10th we returned on the ferry to Livorno and then onto Verona. If I were a good writer I could perhaps capture what a fabulous trip this was. The riding was great, we had great fun every night at dinner and the lunches were out of this world. The real purpose of the van was to have a sumptuous lunch every day. It was quite an operation: we would find a delightful place to stop, we would set up tables and benches, the pots would come out along with propane burners and fresh pasta would be made. And we would have vegetables, bread (good French bread), cakes, wine, cheeses, salami, and on and on. It was a feast. The Wednesday morning club ride started out with sunny skies and a temperature of 12C (54F). We knew that the weather was going to turn colder with rain so we made a good pace to Bardolino. Frequently we stop at the same place in Bardolino for an espresso, at a coffee bar owned by Rosanna. Making good espresso is serious business in Italy. Water heated to a precise temperature is forced at a precise pressure for a precise period of time through beans reduced to a precise grind. The liquid that emerges should be very dark, thick and rich, with a tan layer of emulsified oils and proteins on top that the Italians call crema. More scientifically, the water must be heated to a temperature between 194 and 203 degrees Fahrenheit, then forced at nine bars of pressure, or about 135 pounds a square inch, through a quarter-ounce of finely ground coffee for 25 to 30 seconds, creating exactly one ounce of espresso. Think of it this way, the 4 M's necessary for a good cup: Miscela (the blend), Macinatura (the grind), Macchina (the espresso machine), Mano (the skill of the machine operator). 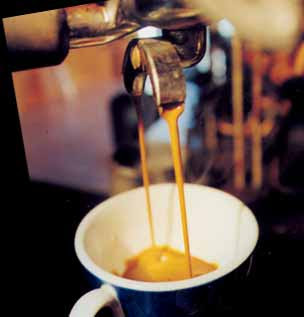 In Italy, making espresso is a profession and an art. After a good cup we rode to Boscomantico for lunch. The temperature was 48F when we arrived and it was getting colder by the minute. That didn't prevent us from having a long lunch in the Italian tradition. I Wonder What Campagnolo is Thinking? 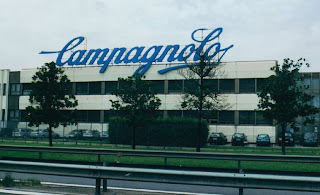 Keep in mind that Campagnolo is just east of Verona, in Vicenza. Today, after a nice ride at 58F, I visited the Chesini bike shop here in Verona to say hello to my friend and there in the window was a SRAM Force gruppo from the USA! Shimano is very popular in Italy but I was surprised that the newly introduced SRAM gruppos are already appearing in shops here. They must be in shock in Vicenza. The Giro has had stages ending in Verona 17 times in the past. 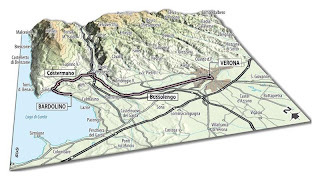 This year the individual time trial from Bardolino to Verona could determine the outcome of the race if the previous two days in the mountains have not crowned the champion. 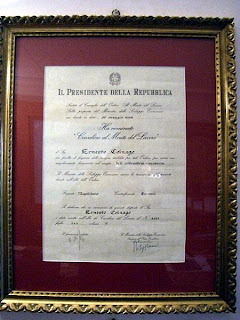 "This Friday, the man they call "il mago di Cambiago" (the wizard of Cambiago) treated his diamond anniversary like business as usual, working a full day in the office as always, with the exception that he had extra visits, faxes and phone calls from his many of well-wishers. Ernesto Colnago still has the passion of a teenager for racing bicycles and bicycle racing. "Tomorrow Petacchi will win," referring to the Milram sprinter's Italian debut in the GP Etruschi (and he did - ed.). "We are sponsoring two ProTour teams, and Landbouwkredeit, Panaria, Navigators and Tinkoff, as well as disabled champion Fabbrizio Macchi, the CAP Arreghini MTB team with Eva Lechner and amateur teams like Pallazago-Vellutex. It's a lot of work for us, but we love racing and this gives us the input we need to improve our products every year." 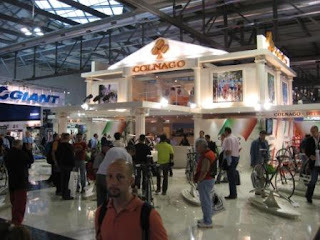 After over six decades, for Colnago, his passion still burns bright." It was 15C (59F) today! A glorious, sunny day. 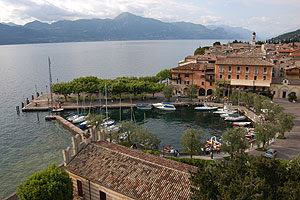 Hopped on my my steel bike (which I'll write about in the future) and headed off to Lago di Garda. On the way I came across 3 young kids (10-12 years old I would guess) from a Pescantina club riding fixed gears spinning their legs off. Arriving at Bardolino I stopped for a quick espresso and then headed north to Garda and then Torri del Benaco. 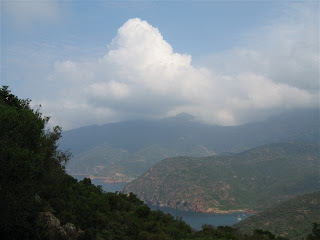 Torri is a very small lakeside town with a picturesque harbor. At the center of town, off the main road, you turn right and climb towards San Zeno. 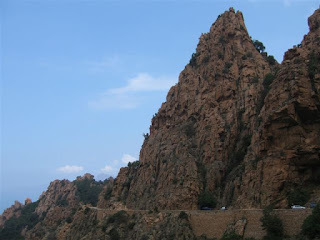 This road offers spectacular views of the lake, has nice switchbacks and provides a good work out without being unduly difficult. On the way up I was passed by most of the Cicli Mantovani team that was training here on their Liotto bikes all the way from Vicenza. I hung in there with the slower members but jeez...these guys were all so skinny. From San Zeno I wound my way back to Verona. 4 1/2 hours in February is a nice gift. Photo: harbor at Torri del Benaco. The raduno schedule for March and April has been published (see below); the first event will be on March 11th. I've bolded the different towns they will start from (all in Verona province). I've previously written about "raduno" events but to re-cap: each UDACE (the national organization) club sponsors an event during the season. The ride is low key, it's not a race, with food and prizes afterwards; prizes are giving out on the basis of clubs with the highest number of participants. The neat thing about the ride is that the roads are closed off as approximately 500 riders come through towns and intersections with the lead car's speakers blaring "corridori in arrivo". My own club, Gruppo 1, will be hosting the April 22nd event. 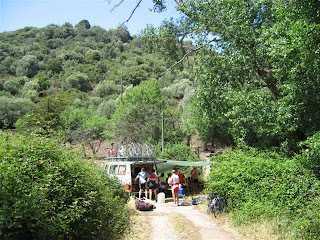 The first week in September, 2006, the club did a ride in the Po Delta in the vicinity of Porto Tolle, Goro, and smaller villages. On a map you will find it south of Chioggia (which is at the southern edge of the Venetian lagoon). It was incredibly beautiful. 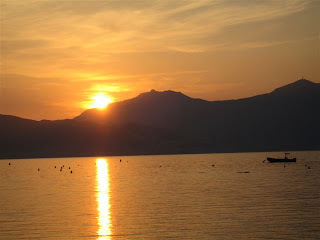 The Adriatic was shimmering, the marshlands dramatic, a sea of peace and tranquility. I felt I had been transported to another planet. It was one of my favorite rides of 2006. 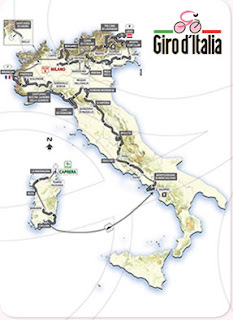 Cycling is a great way to see Italy! Photos: scenes from the ride, including a bridge built on boats and fishing shacks. Last night, all of Italy was treated to special gift, the TV debut of new film Il Pirata-Marco Pantani. Italian broadcaster Rai Uno aired the film by Producer Bibi Ballandi and Director Claudio Bonivento, which was greeted with praise by those who knew Pantani best. Giuseppe Martinelli, Director Sportif of Pantani for 11 years, watched the film with his Lampre-Fondital team at its training camp. "I saw the film with [Damiano] Cunego and the other boys on my team, and the atmosphere was surreal," he said to La Gazzetta dello Sport. "The interpretation was very realistic and done exactly. But I would have liked to have more scenes when he was a baby boy with dark curly hair." The film opened with images of Pantani when he received his first bike from his Grandpa, and started to appreciate the joys of two wheels. "On the other hand this was a sad story that left me a bitter taste in my mouth. I hope that those who loved Pantani also liked the film." Discovering Pantani in those days when he was riding around on his newly gifted bike was Giuseppe Roncucci. The Romagnolo started working with Marco at 11 years-old, convincing him to join his racing club. "It was short. [The film] starts and ends. For us it was a lifetime, that seems like it has not yet ended," remarked 71 year-old Pino, who was portrayed by Italian Omero Antonutti in the film. "Antonutti is a great actor. We had talked a long time. He asked me for advice and I said 'I don't know, you are the artist.'" The parents of Pantani, Tonina and Paolo, had already seen the film during its initial screening but last night was a time for them to reflect on their son’s life. "The other day when we watched the film for the first time, together with the director Claudio Bonivento and actor Rolando Ravello, we were very emotional; we were hit and overwhelmed; it was hard," said Pantani's mom. "There were a lot of similarities," said Paolo, who did object to some scenes. "Marco as a baby, Marco in the gruppo and no one could drop him, Marco who raced and at every chance attacked. He had a special relationship with his grandpa Sotero. He searched for my partnership because he feared his mom would be upset with him. I was his dad, but also his friend." Tonina and Paolo keep Marco's memory alive with a special school, Pantani Corse. It is a team based in Forlì that consists of 40 children. "Marco had entered into a tunnel but out of that are [these] 40 children of Pantani Corse. ... Tonina and I, every Saturday and Sunday, go to see them race." According to La Gazzetta dello Sport the film was watched by 5,571,000 viewers. I am still using my 4-5 year old Pinarello "Marvel". It's an aluminum frame with carbon seatstays and fork. The gruppo is Shimano 10 speed Ultegra with a 52-39-30 triple with 12-25 in the back. While I can't say I like how the triples look in general, I can praise how well this Shimano system works. The 30 is nice for spinning up steep climbs, or saving me at the end of a long day of climbing. At this point I'm also trying to avoid knee problems, etc., from being undergeared. I have thought about using a compact system but I think some of the jumps between gears on that set-up are too large. So, I'm happy with this as I can go anywhere without fear of having to turnaround or walk (walking is the worse, right?). I have other bikes here as well. For a beater city bike I have an old Vicini. It's actually a cool bike with lots of Campagnolo components. It's looks beat so it doesn't attract attention. It has very weird geometry with a lot of fork rake and long chainstays. Then I have a beautiful steel bike I discovered in the back of a store here. It's a handcrafted bike, made to measure, that just fits me perfectly. The ride is sublime and I enjoy riding it so much more than the Pinarello. But the steel bike has no low gearing...using it is making me stronger though. Photo: a stop at Olio Salvagno and the olive mill which is a few KMs from where I live. I sometimes take a backpack and bring home goodies; their olive oil is widely available in Verona shops. The Salvagno Family have their roots from Venice. After the fall of the Republic of Venice at the beginning of the eighteenth century the family left the trading business and moved to the hills outside of Verona. They went into farming and became one of the first families in the country to specialize in the growing of olive trees. After many decades, their production grew and the beginning of the nineteenth century they opened an oil-mill for family use and even though larger equipment was installed, today Salvagno still keeps the same traditional method for producing extra virgin olive oil. 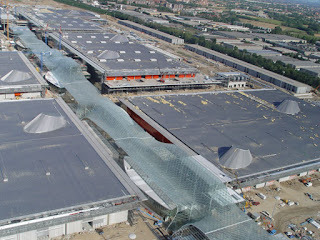 See http://www.oliosalvagno.it/ for more information. After a long morning stroll around Verona exploring old palazzi with E., I took a solo ride eastward to Soave. The fog from yesterday was gone and it was a gorgeous sunny day with the temperature at 12C (54F). The idea was to go for an easy spinning ride and just enjoy the afternoon sun. 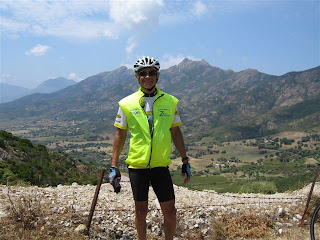 While riding west from Verona to Lago di Garda is immensely popular I also enjoy riding east into the Soave region and into the walled city of Soave. One of the few medieval walled cities still entirely surrounded by its walls, Soave has entrances through only three towers: Porta Verona, Porta Aquila and Porta Vicentina. Soave was populated during the Roman era and most of the important buildings in Soave date from the Middle Ages and beyond, like the Scaligero castle, which looms above the city on a steep hill. 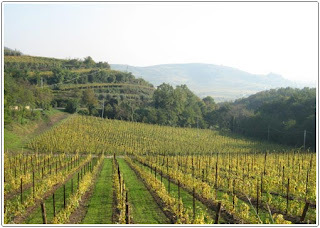 Soave is also known for its fine wine of the same name. Within Verona province we have the wine regions of Valpolicella, Soave, Bardolino and Custoza. How lucky can someone get? 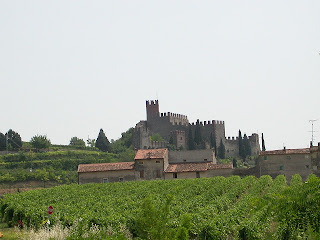 Photos: the castello (castle) at Soave in the distance and vineyards. This morning was very foggy, not an unusual winter occurrence in Verona. Visibility was low but the Saturday a.m. ride was on. After a few kilometers everything was soaking wet. About 10Km from Verona we were in sunshine and at Lago di Garda it was a spectacular, sunny day! Photos: the fog this morning on Ponte Nuovo in Verona, and the same view on a clear evening at sunset. I know, I know....this is a cycling journal. But, there may be times when I just have to take a detour into Italian culture. It turns out that the 70-year-old former prime minister, whose own heart now beats with a pacemaker, attended an awards ceremony last week and was overly friendly with two young and beautiful guests. 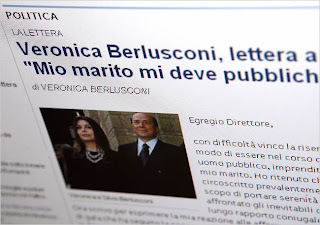 Beppe Severgnini, one of the most discerning commentators on Italian mores, quickly churned out a column for Corriere della Sera summing up its import. Off to the gym now; cold, foggy and damp today, and I have a sore throat from yesterday's ride.